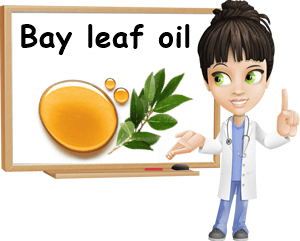 Bay leaf oil is a type of essential oil made from the leaves of the bay laurel, also called sweet bay (Laurus nobilis). Another species, the West Indian bay leaf (Pimenta racemosa), also allows for the extraction of the essential oils in the leaves and the production of an oil with the same name. Today’s article considers the uses, properties and health benefits of bay leaf oil made from the leaves of Laurus nobilis, the same species widely used for flavoring food in Mediterranean cuisine. What is bay leaf oil? 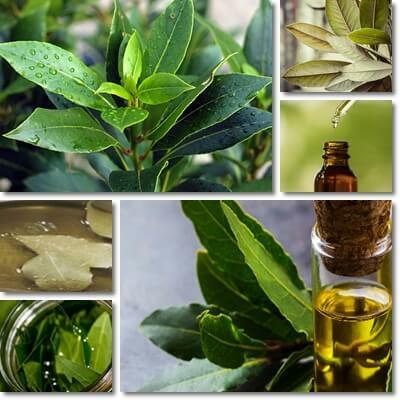 Bay leaf oil is the oil extracted from the leaves of the bay laurel, Laurus Nobilis. It is an essential oil, meaning it is meant for external use only and should not be ingested. It is obtained from the mature, fresh leaves of the bay laurel tree through a process called steam distillation. The process allows for the extraction of the main essential oil constituents from the leaves. The essential oil constituents are responsible for the particular aroma of bay leaves and a source of varied health benefits. The uses of bay leaf oil cover a range of health aspects and primarily include benefits for nerve and muscle pain and joint swelling and pain. Some of the less known benefits and uses of bay leaf oil are a natural decongestant action, antibacterial and antifungal effects, astringent properties as well as a mild sedative quality that contributes to lowering stress and anxiety levels. Bay leaf oil is added to bath water, soap and other skin and hair-products. In hair care, it is used for strengthening hair, maintaining scalp health, controlling dandruff, combating dullness and restoring shine. Some of the aromatic compounds that give bay leaf oil its characteristic scent exhibit analgesic properties and can help relieve arthritis-related joint inflammation and pain. Limonene, linalool, myrcene, estragol, eugenol, alpha-pinene, beta-pinene, phellandrene are the most prominent aromatic compounds in the oil with proven pain-relieving properties. Myrcene is of particular interest because it has been shown to pass the skin barrier and reach the bloodstream, which could be one explanation for the reduction in swelling and pain relief observed with the use of the oil for joint pain management. Still, bay leaf oil for joint pain should be used cautiously (in small amounts, diluted in a carrier oil). One of the best bay leaf oil uses is for treating neuralgia, or nerve pain. Neuralgia is essentially pain along the course of one or more nerves. Even at modest intensity, it can be debilitating and interfere with daily life. Applying very small amounts of bay leaf essential oil diluted in a carrier oil such as olive oil onto the affected area and massaging it onto the skin can help provide temporary relief. Once again, the biologically active compounds responsible for the analgesic action of the oil are limonene, linalool, myrcene, estragol, eugenol, alpha-pinene, beta-pinene, phellandrene. In addition to pain-relieving properties, many of the aromatic compounds extracted in bay leaf oil (eugenol, estragol etc.) also exert an antispasmodic action, recommending the oil for use in the treatment of muscle cramps and spasms. The oil is to be used for massaging the affected area. Complementary to the antispasmodic effects of the active constituents, the massage serves to stimulate circulation, increasing the absorption of the active constituents into the skin for a stronger antispasmodic effect. The analgesic effects of the oil further help in the treatment of muscle aches and pain. This particular property is also at the root of the recommending bay leaves, bay leaf tea and even oil for relieving cough in common cold and flu infections. Studies show eugenol in bay leaf oil has antibacterial activity and is effective against a range of Gram-positive and Gram-negative bacteria as well as holds antifungal properties. For example, in vitro studies show eugenol inhibits bacteria such as Escherichia coli, Staphylococcus aureus, Pseudomonas aeruginosa, Klebsiella pneumoniae, Helicobacter pylori, Salmonella typhi and Candida albicans, pathogens that cause infections of the skin, respiratory system, digestive tract and more. Other aromatic compounds also hold antibacterial and antifungal properties. Bay essential oil actively inhibits the growth of bacteria and fungi, preventing infections of the skin. When used in massage therapy, it moisturizes the skin and prevents drying that could predispose to infections. As an astringent, it can help with faster wound healing. However, given that it can act as an irritant, it is always recommended to use it in combination with a carrier oil such as olive oil. Bay leaf essential oil is a great choice for an aromatherapy oil to use in a diffuser. Infusing the air with warm, spicy, earthy, herbal bay leaf notes can promote relaxation and induce calm. Moreover, the aromatic compounds myrcene has mild sedative properties and further contributes to restoring a feeling of calm, reducing stress and lowering anxiety levels. Bay leaf oil lends itself to topical use and one of its best applications is maintaining scalp health. Applying a few drops of bay leaf oil diluted in a carrier oil such as olive on the scalp and massaging it for several minutes can help improve circulation to the root of the hair as well as combat dryness and even dandruff. Two of the most common causes of dandruff are dry scalp and fungal infections and bay leaf oil both moisturizes the scalp and has antifungal properties which recommends it for use for scalp health. Bay leaf essential oil is called a hair tonic because of its moisturizing action. Aromatic essential oils and fatty acids nourish hair and help restore shine. Regular application in combination with a carrier oil can help combat dryness, strengthen hair and improve scalp health for better-looking, healthier hair. Both bay leaves and the oil obtained from them can be used to repel bugs and roaches and other insects. Eucalyptol, the main aromatic compound in the oil, is a proven insect repellent, but other compounds are also toxic at certain concentrations and, as a result, may also hold similar insect-repellent properties. Also see the 7 Benefits of Bay Leaf Tea. Other purported benefits and uses of bay leaf oil include stopping nosebleeds (presumably due to its astringent action), soothing toothaches and preventing tooth infections (as a result of the analgesic properties of the constituent eugenol and the antibacterial properties of the oil), soothing stomachaches, fever-reducing action, relieving cough and other cold and flu symptoms, anti-diarrhea action and other digestive benefits. What does bay leaf oil look like? The oil is light yellow to greenish-brown and packed in dark containers to prevent light from going through. Light, heat and air exposure can oxidize the oil constituents and reduce their biological activity. What does bay leaf oil smell like? It has a particular aroma reminiscent of bay leaves. More exactly, bay leaf oil is strong-scented with pungent, warm, spicy, earthy, herbal notes. – For use on skin, pure (undiluted) bay leaf oil should be combined with a carrier oil such as olive oil. Applying the undiluted product on the skin can cause irritation and burns. – Before first-time use, test for allergic reaction by applying a drop of the oil on a small portion of skin. Wait for 24 hours in case of potential allergic reactions. – Should not be ingested because it is toxic for the liver – Bay leaf oil is not intended for internal use!